Objectifs de développement durable: le secteur privé à la rescousse des gouvernements ? Le Forum politique de haut niveau sur le développement durable (HLPF) se déroule du 10 au 19 juillet à New York, avec pour mission de faire le bilan annuel de la mise en œuvre des Objectifs de développement durable. Si l’objectif d’éradiquer toute forme de pauvreté partout sur la planète d’ici 15 ans est ambitieux, il convient cependant de rester critique quant au rôle à jouer par le secteur privé. Eclairage avec le réseau international Social Watch. Implementing the 2030 Agenda: Will Belgium step up its efforts? In September 2015, Belgium declared that the 2030 Agenda will give a new élan for Belgian global engagement, calling for human rights, LGBT rights, women's rights, decent work and the power of digitalization, concluding that Belgium was ready to implement the agenda. However, by referring mainly to international cooperation, it was not clear if Belgium accepted the challenge to also change its national policy in order to reach the 2030 Agenda. A national strategy framework is to be established by September 2016 involving all levels of government, under the auspices of the Inter-Ministerial Conference for Sustainable Development, which is best suited to ensure a coherent strategy among the three regions and the federal government. Nevertheless, midway into the first year of implementation, the policy actions needed remain distant. Belgian civil society organizations demand and urgent and clear response to the challenges of this ambitious universal 2030 Agenda, and to commit to develop an integrated, overarching strategy covering internal and external affairs. In New York heeft een topontmoeting plaats over de duurzame ontwikkelingsdoelstellingen, beter gekend als de Sustainable Development Goals (SDG’s). Op dit zgn High Level Political Forum (HLPF) wordt een eerste stand van zaken opgemaakt over hoe landen zich inzetten voor een betere wereld tegen 2030. In September 2015, Belgium declared that the 2030 Agenda will give a new élan for Belgian global engagement, calling for human rights, LGBT rights, women's rights, decent work and the power of digitalization, concluding that Belgium was ready to implement the agenda. However, by referring mainly to international cooperation, it was not clear if Belgium accepted the challenge to also change its national policy in order to reach the 2030 Agenda. A national strategy framework is to be established by September 2016 involving all levels of government, under the auspices of the Inter-Ministerial Conference for Sustainable Development (IMCSD), which is best suited to ensure a coherent strategy among the three regions and the federal government. Nevertheless, midway into the first year of implementation, the policy actions needed remain distant. Belgium should have had a head start, since a 1997 law on the coordination of the federal policy on sustainable development authorizes the federal government to set out a plan that takes into account the long-term vision of sustainable development and international commitments taken to realize it. The SDGs are the result of a political negotiation and are not always as ambitious as needed. Yet the achievement of these goals would be a crucial step forward. It is important that Belgium meet the challenges of this universal 2030 Agenda through an integrated, overarching strategy. 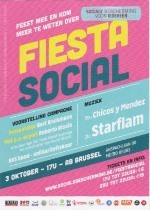 With a "Fiesta Social" combining music, films and speeches, some twenty Belgian civil society organizations launched last October 3 a major campaign titled "Social protection for all" with the aim of defending social security as a human right in Belgium and abroad. La coopération internationale est en péril. En Europe, qui reste malgré tout le premier donateur mondial, les montants de l’aide publique au développement (APD) ont baissé pour la première fois depuis 2007 . La Belgique ne fait pas exception. En temps de crises, la tendance est à la restriction budgétaire, au recul. Le spectre de la pauvreté plane sur les européens également. Les fermetures d’entreprises et la remise en cause des acquis de l’État-providence sont autant d’arguments pour dire combien les temps sont difficiles. La coopération au développement doit être redéfinie, en tenant compte aussi de la place qu’occupent les pays émergents dans les débats globaux, leur forte croissance économique et leur présence accrue sur le terrain de la coopération. “International cooperation is in danger. In Europe, which is still the biggest donor in the world, official development assistance fell for the first time since 2007, and Belgium is not an exception. In times of crisis the tendency is for fiscal austerity”. This is the conclusion of the National Cooperation Centre for Development (CNCD-11.11.11) in its contribution to the Social Watch Report 2013. In terms of gender equity Belgium places itself above the European average, and its only neighbour in a better situation is Germany. Twenty-five years after the Chernobyl disaster, and when another tragedy is going on in Japan, the Belgian chapter of Greenpeace International, WWF, the Walloon Inter-Environmental Federation and Bond Beter Leefmilieu (BBL) launched the national platform "Stop & Go" that calls for the end of nuclear energy generation and claims for promoting renewable sources.